“Queen Anne’s lace is one of the great undiscovered herbs of the 20th century,” says Alabama herbalist Darryl Patton. “It is a weight reducer, probably the best to be found.” I think that statement applies to the 21st century, too. Also called wild carrot because its edible root is the predecessor to our cultivated garden-variety carrot, Queen Anne’s lace reduces weight through a diuretic action, and perhaps speeds up the metabolism. 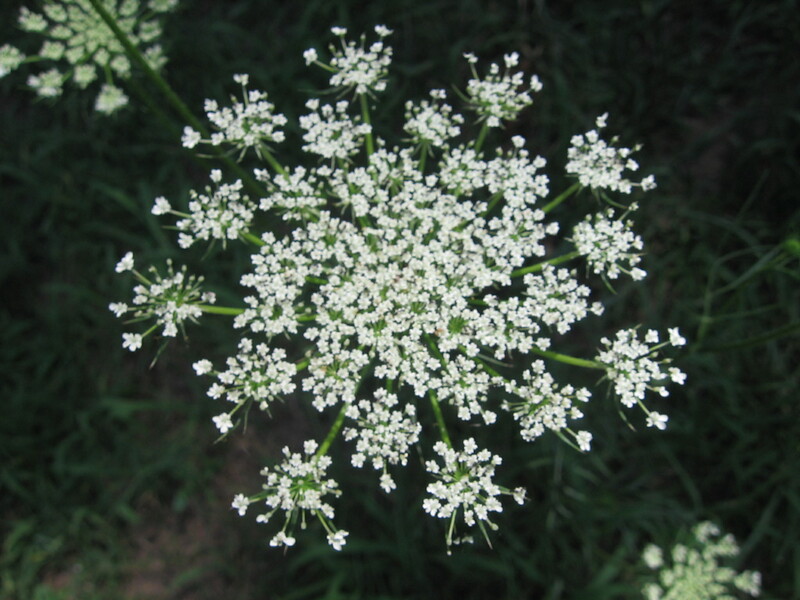 Many genus and species in the carrot family (Apiaceae, or Umbelliferae) have a similar diuretic action, but less powerful than Queen Anne’s lace. Due to its diuretic properties, Queen Anne’s lace (Daucus carota) can relieve the edema in one’s ankles. The old-timey herbalist, Tommie Bass, suggests boiling 2 handfuls of leaf and flower in a quart of water for 20 minutes. Just a heads-up: This makes a bitter brew. 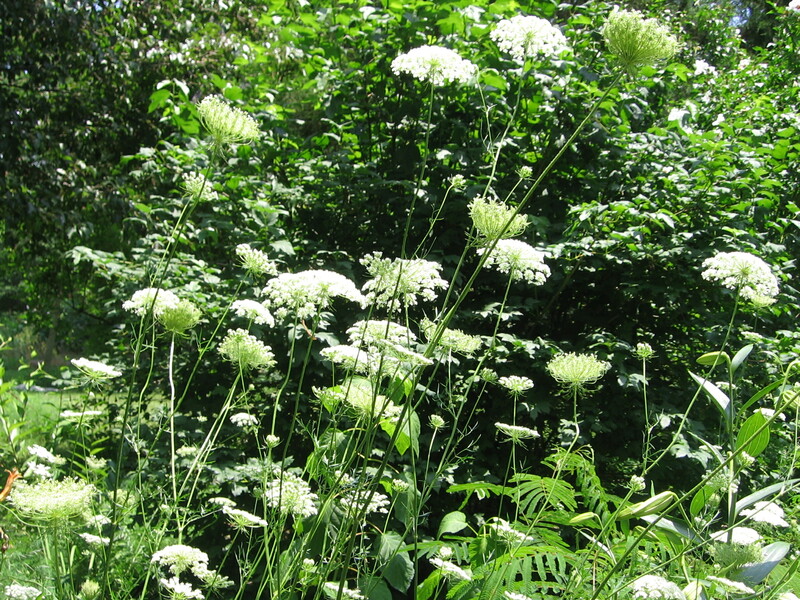 Other uses of the leaves and flowers of Queen Anne’s lace are for kidney stones and gout. It has mild liver-cleansing properties, which helps prevent uric acid from staying in the joints, causing the awfully painful gout. The leaf tea can also help to bring on a woman’s delayed menses, which is called an emmenogogue. However, first she needs to be sure that she isn’t pregnant. For first-aid in healing sores, the leaves are applied to the skin sore with honey. The seeds are forming on the closed infloresence of Queen Anne's lace. 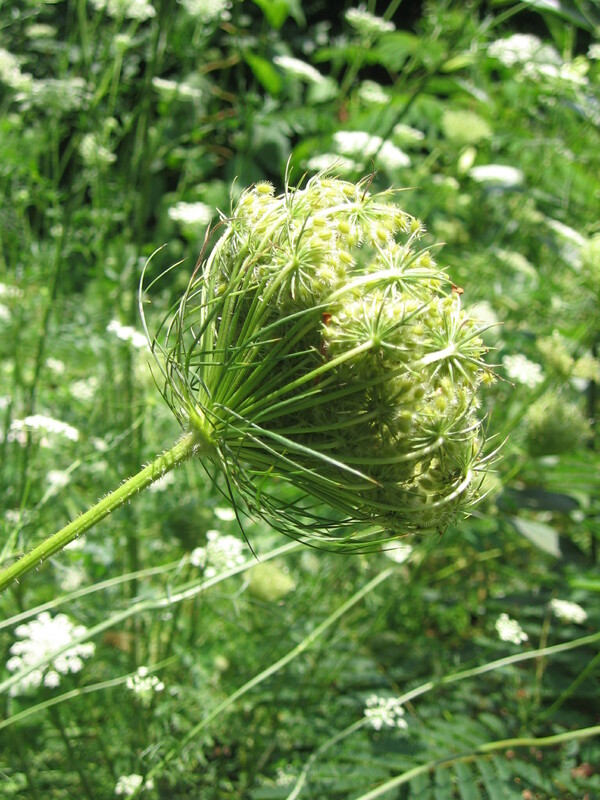 Queen Anne’s lace seed is taken to relieve bloating, or “wind” as it is sometimes called, evoking the natural elements. The release of wind can also give the appearance of weight loss. 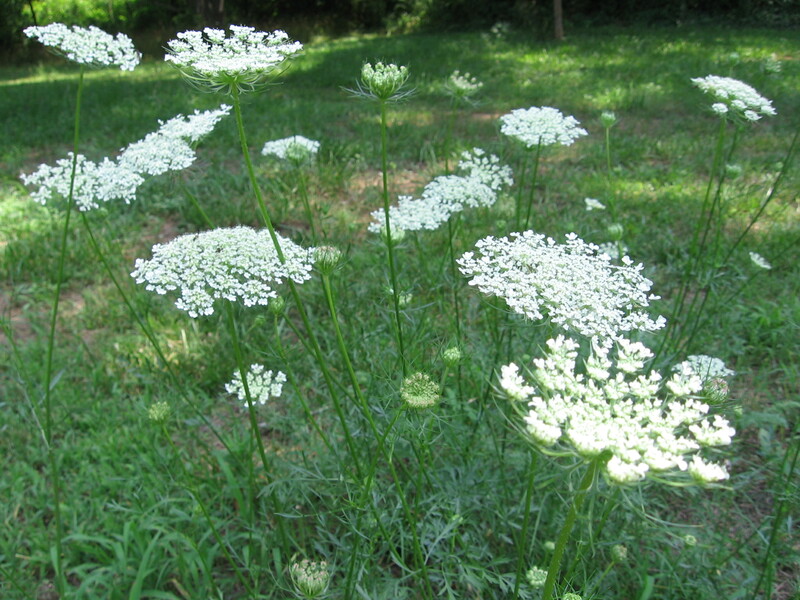 Wild carrot, or Queen Anne’s lace, was a popular diuretic, anodyne (pain reliever), and antiseptic during the Civil War according to Confederate surgeon, Dr. Francis Peyre Porcher. Nicholas Culpeper, the 17th century English physician-herbalist-botanist, writes about the difference between garden carrots and their wild kin, saying, “They are of less physical use than the wild kind (as indeed almost in all herbs the wild are most effectual in physic, as being more powerful in operation than the garden kinds).” That’s a little plug for learning wild plants, and even incorporating them into your landscape. Queen Anne's Lace gracefully used in a garden. Takes full sun to partial shade.